I am trying to make sure to teach my kids that Christmas time is not just about getting gifts from Santa and mom and dad, but is also about giving. One of the ways that we focus on giving (not getting) during the holiday season is by finding simple ways to serve others. 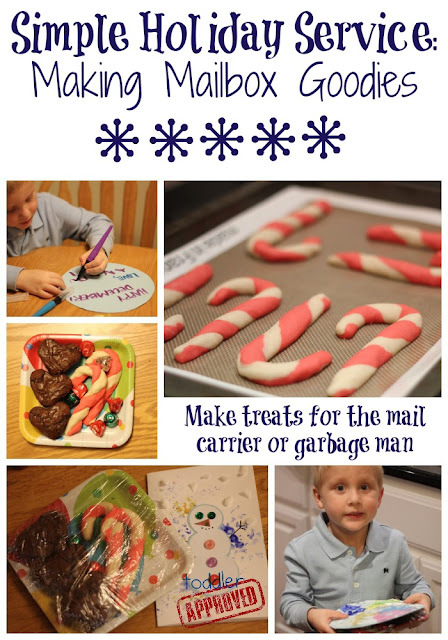 We were inspired by Mom it Forward's new e-book featuring 31 Days of service, so today we are sharing the simple way that we served our mail carrier by making some mailbox goodies! 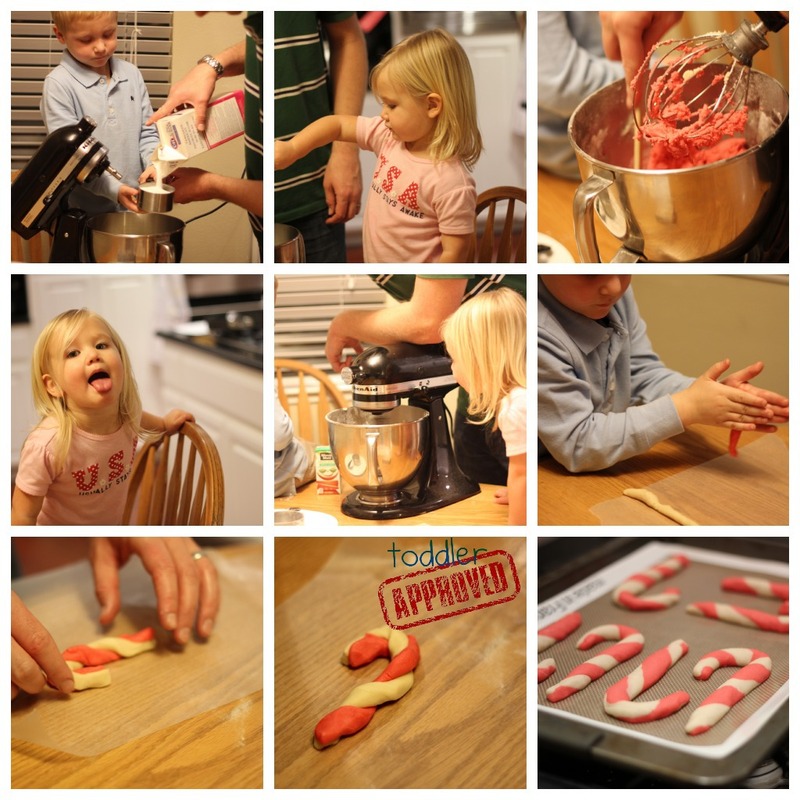 One of my husband's favorite traditions growing up was making candy cane cookies with his mom! This weekend he decided to teach our kids how to make them. It was adorable to see how excited the kids were. Their favorite part of baking was taste testing! Heat oven to 375. Mix butter, shortening, powdered sugar, egg and flavorings. Blend in flour and salt. Divide dough in half. Blend food color into one half. Shape 1 tsp of each dough into 4 inch rope- press together and twist. Topping: 1/2 cup crushed peppermint candy and 1/2 cup sugar. 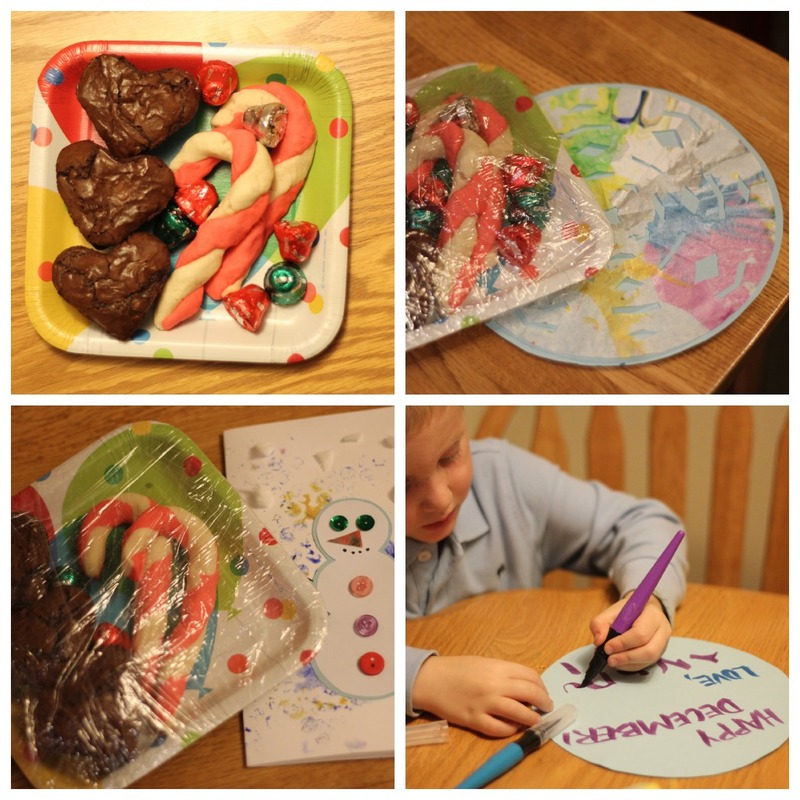 After we made (and tasted) the candy cane cookies, we assembled them onto some plates along with a few other holiday goodies and wrapped them up. Then my son made a few cute holiday cards using some of the finished painting projects we did this past weekend at my daughter's second birthday party. My favorite card featured a snowflake made from some of our spin art. We dropped off a few plates at our neighbor's houses and then left one special plate in our mailbox (with the flag up and a big note) for our mail carrier. I think this little four year old might be spending a good chunk of the morning watching for the mailman out the window! It is so fun to do simple activities of service. I love seeing how excited my kids are to do kind things for other people. What are simple ways that you like to serve others during the holiday season? Head on over to Kid Stuff World to check out all of the other posts by bloggers who are participating in the 31 Days of Service calendar. Don't forget to get your free e-book by Mom it Forward as well which has a detailed description of each day's service prompts. Adding this to our advent chain! These cookies look so fun-we're totally going to make them! And thanks for linking to the e-book, I saw something like it last year and have been trying to find it for weeks. We're also focusing on giving service instead of getting presents this year. Our version of the mailbox gift was to bundle together some chocolates and candy canes and secretly put them in every mailbox on our street so each of our neighbors get a cute surprise when they pick up their mail. Like yours, my kids were glued to the window spying on the neighborhood the rest of the day! Love that treat idea Michelle! So glad to link you up to the ebook. Such a great resource! I love that this is your husband's favorite tradition and your focus on teaching your children about giving, not getting! This was a beautiful post ... thank you so much for sharing! Thanks Stacy! I am so glad you introduced me to the service e-book. What a great resource! I love that you made homemade goodies. We gave up some of our Candy Cane Hershey's Kisses to thank our mail carrier. He/she has no idea what a sacrifice that was LOL! We are so addicted. We loved making a handmade card. I wish I could see the reaction. Such a fun way to spread Christmas cheer! Thanks for the inspiration for this Jyl! How sweet of your kids to sacrifice their favorite treat. Definitely a great way to serve. I love that you involved your kids in this project. I love serving with my children. It makes the holiday season have so much more meaning for us. Thanks Jill! It definitely makes the holiday season so much sweeter to do nice things for others.